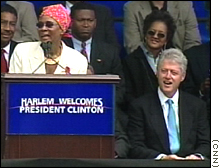 Harlem native and mistress of ceremonies Cicely Tyson welcomes Clinton. Proclaiming Harlem as his home Monday, former President Bill Clinton said he wants to help revitalize the largely African-American district and use his new office there as a base for a global initiative to fight AIDS and poverty. "What I'm going to do here is to try to help promote economic opportunity in our back yard, in our country and around the world," Clinton said in a speech that resonated with political undertones. Political leaders from the African-American community and the New York area praised Clinton throughout the lengthy outdoor rally, celebrating the former president's first day in his Harlem office. "Now I feel like I'm home," Clinton said as the crowd cheered. The celebration got under way Monday morning, just blocks from Clinton's new office on 125th street. Clinton explained that his wife, Sen. Hillary Rodham Clinton, New York's Democratic junior senator, and daughter Chelsea were not at the ceremony because of a family illness. Gov. George Pataki proclaimed Monday as "William Jefferson Clinton Day" in Harlem. Supporters chanted "We Want Bill" while a small group of protesters told the Arkansas native to "go home." Clinton abandoned plans earlier this year to rent office space in Carnegie Towers, a midtown building that would have cost twice the amount of his Harlem office. In the wake of that controversy, the former president said he chose the New York neighborhood of Harlem because he wanted to be part of the federal empowerment zone -- which provides federal aid for an economically depressed area -- he helped to create. 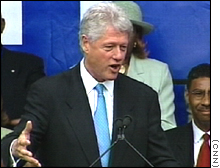 "It was very significant that ... former President Clinton would have his office located here in central Harlem," said Terry Lane, president and CEO of the Upper Manhattan Empowerment Zone. "His being here helps to budget the economic fiber of urban America." However, not everyone thinks Clinton's arrival will spark an economic resurgence. About a dozen members of the New Black Panther Party voiced their disapproval during Monday's celebrations, telling Clinton to go back to Arkansas and chanting "Whose streets? Our streets!" Members of the radical, largely African-American group believe Clinton's move could increase rent so that local businesses would be forced out of the area. "I want to make sure I'm a good neighbor in Harlem," Clinton said. "I'm glad the property values are going up, but I don't want the small business people to be run out because I'm coming in." Clinton : "I want you to know that I want to be a good neighbor ... on the best days and the dark days, for all the people here in Harlem." The U.S. government pays for office space for retired presidents for life, including $93,000 a year for former President Carter's Atlanta office and $285,000 a year for former President Reagan's Los Angeles office. Clinton's 8,300-square-foot office, which has a private bathroom and a personal shower, will cost about $354,000 a year, after renovations. That's about half of the $700,500 price tag for the midtown office Clinton was considering. However, some critics feel taxpayers should not have to pay former presidents' rents. "This is nothing more than corporate welfare for Bill Clinton, incorporated," said John Berthoud of the National Taxpayers Union. "He's going to have earning potential of millions and millions of dollars because he's a former president. There's no reason in the world we should be paying, taxpayers should be paying hundreds of thousands of dollars a year to subsidize his office space. It's ridiculous." Berthoud noted that his organization's stance is not a partisan issue. "We criticized it when President Reagan got his pension and his office space," he said. CNN correspondents Brian Palmer and Maria Hinojosa contributed to this report. In the 1970 movie, "Cotton Comes to Harlem," directed by Ossie Davis and based on the novel by Chester Himes, two black detectives, Gravedigger Jones and Coffin Ed Johnson, go to great and hilarious lengths to uncover the real rip-off artists who swindled a bundle from the charity of good-hearted Harlem residents. It was a classic "things ain't what they seem" caper. I thought of that movie as I joined President Clinton and a cavalcade of former members of his administration at the recent opening of his post-presidential Harlem headquarters. 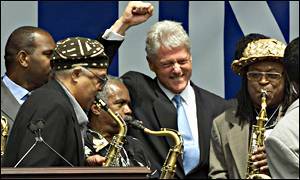 In the wake of his overwhelming welcoming by the residents of Harlem, many pundits have speculated and some have outright insinuated that Bill Clinton has hoodwinked black America. They assert that underneath the smooth black handshakes and memorized lyrics to the black National Anthem, lies a wolf in sheep's clothing who simply uses black people to further his own selfish agenda and legacy. They wonder how, in the face of "ending welfare as we know it," and dissing Jesse Jackson by dissing Sista Solja, could we maintain such allegiance to this white man from the sticks of Arkansas. Quite frankly, the question smacks of paternalism and condescension --- as if black people are not smart enough to figure out who is our friend and who is not. The fact is, most African Americans consider Bill Clinton to be a bona fide brother. I use that term in the broadest biblical sense. It does not mean that Clinton is an honorary black man or the first black president. And it doesn't mean that his positions on issues affecting black Americans are universally accepted throughout the community. Welfare reform and school vouchers are two notable points of vigorous debate. 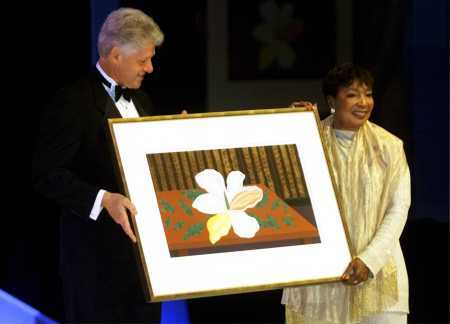 But, Bill Clinton has earned the respect and admiration of most African Americans, both for his words and his deeds. To most of us, his long-standing embrace of black people, black culture, and black concerns is, well, unimpeachable. 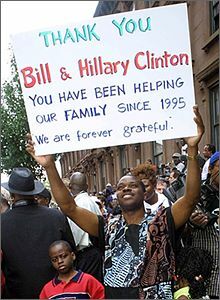 Black people took note and did not forget that it was Bill Clinton who fought for the expansion of empowerment zones to places like Harlem. It was Bill Clinton who insisted that we "mend, not end" affirmative action. It was President Clinton's voice of outrage that led the chorus against the outbreak of church burnings and hate crimes across America. And it was Bill Clinton who kept his promise to put together a Cabinet and White House staff that "looked like America." The fact of the matter is, black people felt that for the first time in a long time there was someone in the White House who took our struggle for equal opportunity and justice seriously. And let's not forget, Bill Clinton did all this while presiding over the longest and strongest economic expansion in history --- a rising tide that lifted all boats from Wall Street to Main Street to 125th Street in Harlem. During his time in office, all the things that really mattered to most Americans improved --- jobs and income --- rose at all levels, crime reached record lows, homeownership reached record highs, teen pregnancy was down, educational achievement and college attendance were up. So, in black America the question is not why we love the man so much, but why you don't. I think there is another thing that many white pundits just don't get when they attempt to assess black attitudes toward Bill Clinton. African Americans really relate to Clinton's cool-under-fire tenacity. As Congressman Rangel said during his introductory remarks on that stage in Harlem, we saw it as no accident that the same people who were out to get Bill Clinton were out to get us first. That may be a tad hyperbolic, but there are many in the black community who believe that the only reason Bill Clinton was hounded so vociferously as President is that he was a friend of black America. And then there is Monica. There is a palpable undercurrent of moral superiority in the voices of many conservatives who contrast their outrage at Clinton's sexual dalliances with the nonchalance with which they are regarded in the black community. To many of us, Monica was a convenient smokescreen for unbridled attacks on a left-of-center Clinton by hyperventilated far-right conservatives. Our "Let he who is without sin cast the first stone" attitude revealed that, in this instance, blacks were not less moral than whites, just less hypocritical. We applauded Clinton for standing tall in the face of that hypocrisy. Strength in the face of adversity. Joy in the midst of sorrow. Faith in the depths of despair. These have been the indispensable garments of black survival for as long as we can remember. In the darkest days of his Presidency, Bill Clinton wore them well. 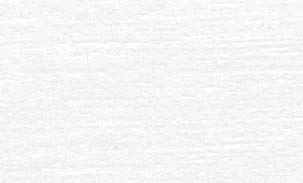 That alone makes him a brother in the struggle. Yes, it is true that his choice of Harlem as his post-presidential home was not his first choice. But Bill Clinton cannot be accused of being a Johnny-come-lately to the African American community or to our issues. That is why I stood with pride alongside both black and white former Clinton officials in front of the Adam Clayton Powell Plaza to welcome the brother home. Terry Edmonds, former Director of Speechwriting for President Bill Clinton, is currently assistant to the President for Government Relations at Morgan State University.